I think our young people are often unfairly stereotyped and maligned. The papers often seem intent on creating an image of young people as lazy, spoiled and shallow, I have seen them described as “snowflakes” for being too sensitive amongst other things. I don’t agree with this and I think that youngsters today are more compassionate and have a greater social conscious than the generations that preceded them. They are more environmentally aware, they care about the plight of the poor and homeless and they are concerned and upset by the wars in the world. They also live in a world that is more complex, connected and sometimes a lot more frightening than the ones their parents and grandparents grew up in. I believe that we should show understanding and compassion towards them and have patience with them as they figure out the world and their place in it. “Another mum asked her why she wanted to go back and she replied that she couldn’t see a future here, that no matter how much you worked it wasn’t enough to live comfortably and the kids turned our strange here”. I argued that children could be brought up well or badly in either place depending and that either place could have a different definition of well brought up and different values around what they thought good upbringing is. Some of the readers who commented on this post brought some insightful and interesting viewpoints to this conversation and really made me think. What got me thinking on this theme again was an invitation to a recent aqeeqah dinner for a friend’s first grandson. I love people and I love socialising so was happy to go with my girls, although poor Little Lady had to be dragged there complaining the whole way. I only knew the host and one other guest, but said hello to the other guests and found excuses to talk to them. A number of the guests were young women who were friends and cousins of the new mother. They avoided us and sat in their own group not saying hello and or engaging at all. When dinner was served they disappeared into another room completely. Little lady was very uncomfortable and hated being there. I felt a bit like an outsider and almost an unwelcome guest. The grandmother was lovely and made us feel very welcome, but she was the only one. Little Lady and my lovely neighbour who is at university often tell me how rude young hijabi’s can be, in particular giving dirty looks to people. I used to argue with them that they were paranoid or reading into things too negatively and they would roll their eyes and say I just don’t see it because I am older and don’t get the same treatment. But there are lot of young hijab-wearing Muslimah’s at my office, particularly in the latest in-take of youth trainees. Groomed, make-up contoured to Instagram perfection, stylish clothes and eye brows on fleek (although this new trend of colouring outside your eyebrows just makes me laugh), but boy can they be haughty. They won’t look at you, they will not return your smile, forget saying salam to a sister. My husband says that kids would never get away with this kind of behaviour in Pakistan. Children are expected to say salam to their parents when they come home from school. They will greet uncles and aunts they meet and family friends or their parents friends. Networking and building relationships is an integral part of life in Pakistan and you won’t get if you don’t build relationships, treat others with respect and learn how to meet and greet people (unless you’re rich of course, in which course none of the usual rules apply). My children are expected to greet anyone that comes into the house and I try to get them to sit with guests and certainly to engage with their children. They can forget leaving a child sitting alone or feeling awkward and disappearing into their bedrooms. I saw too much of this behaviour as a child from children in my family and wider community who would disappear at the sight of guests and not even say hello. These are the same kids who as adults often have no idea how to host people they have never met before or how to behave in specific social interactions such as paying condolences following a death. I know not all young people behave like this. Teenage is a difficult time and sometimes teenagers are still trying to figure things out, but I don’t think there is any excuse for blanking people and many of these people are well out of their teens. I think part of the problem can just be personality, people can be shy and find social situations excruciating, especially if you are naturally introverted and find people draining. But that’s still no excuse not to say salam and ignore people, or move away en masse like a herd of haughty teenage peacocks. I am starting to see some of the young ladies in my office use the prayer room and will always say salam, hold open doors and ask if they need a prayer mat. I can see some of them open up and smile shyly, sometimes they seem surprised that someone said salam to them. Maybe they haven’t been treated with respect or don’t know the value and important of saying salam to each other. It has been narrated from Ibn Umar (RA), that the Holy Prophet (sallallahu alaihi wasallam) said, "He who speaks without firstly giving salaam, then do not answer him (to what he has to say)." Imams Bukhari and Muslim reported that the Prophet (sallallahu alaihi wasallam) said, "A rider should greet a pedestrian, a pedestrian should greet one who is sitting, and a small party should greet a large party, a younger should greet an elder one." I feel like I should comment, because I kept asking myself while reading if I wasn't just as rude as the mentioned sisters and I feel that a perspective from this point of view would maybe lessen the bad impression. I am not a social person, and never have been. I don't have siblings, but I have a family in which everyone seems to have at least 1 doctor title, so performance expectations at school and university are pretty high. This means that for most of my life, I have practised the art of saying no to invitations and "ineffective collective studying" etc. This is hard to unlearn. I have always had many friends, but apart from that I usually don't talk to people more than basic necessity and manners require. I often notice that people around me seem to be much more social and friendly, although I am not actually rude or impolite (I always return greetings and smile if I notice them). I offer help if help is needed, or advice if advice is needed. As to guests: I personally.think that this sister might have a conflict with the childs grandmother, maybe she didnt want to host a big aqeeqah, maybe she only wanted to spend the day with familiar people and felt compelled by her mother or mother in law. This is something I can relate to, although not returning a greeting or totally ignoring you probably wouldn't have been my choice. As to me, I never had practice in hosting guests, because my mother would always send me to my own room to study, so I had an excuse for not being sociable. I sure feel like I lack practise now that I am 21 and married myself, but I also feel that this probably cannot be unlearned, at least not that fast. I feel very uncomfortable in the society of unknown people and generally prefere a quiet, rather solitary environment. I can only conclude with my vague rememberances of a hadith which states that we should try to find excuses for other people's behaviours till we really cannot find some any more, and even then it is best to actually ask for an explanation the person itself.99% of the things we do aren't done to purposly hurt someone, they are due to differences in personality, upbringing and various psychological issues and tempers or unknown circumstances. Ps: My background: I'm a convert for nearly 1 year now alhamdulillah, being european myself and living in an european country, but married to a turk. Yes, yes yes! 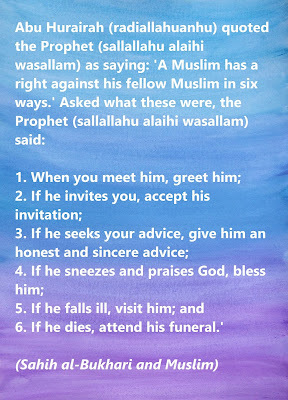 I think there is a difference in being shy/reserved and being a little snobby and anti-social, which is knowing when to respond to a salaam or smile or knowing when to make someone feel welcome. Unfortunately I'm with Little Lady on this one, I've been on the wrong end of dirty looks from hijabis too many times. Sometimes this changes when you speak to them, sometimes it doesn't. I'm hoping girls get less like this as they get older, maybe they'll realise that it's just not the way to go about everyday life if you want to make and keep friends! I think it all comes down to how you are raised. Whether you live in Pakistan or any other country, the fact that you are polite or rude depends on how your parents have raised you. 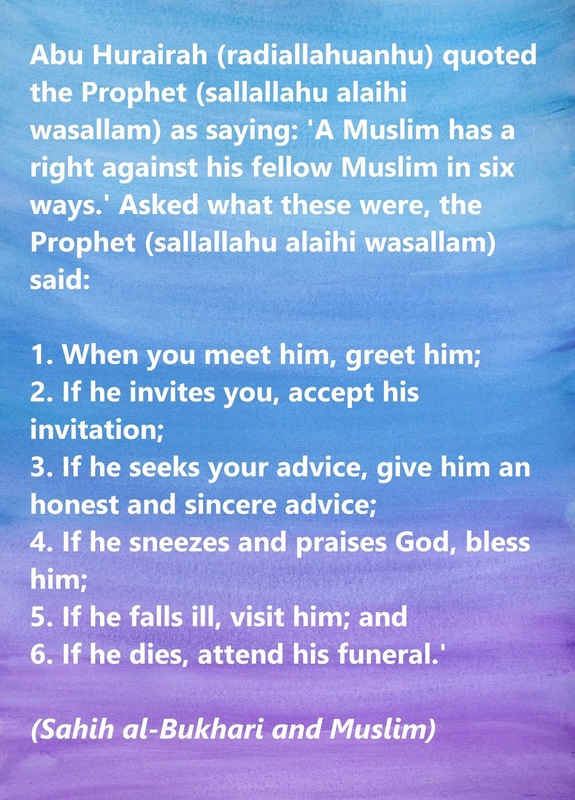 Young Muslims can be very rude, but if their mothers have taught them to greet the guests and be nice, they will do that. Speaking for myself, I am a very shy person and avoid meeting/greeting others because that makes me nervous, but my mother has instilled into me that I must greet all elders even if they don't reply back.